During the course of Project Sewn I did make one extra piece that didn’t fit in with the outfits I had planned. I love it though, the color is just one of my favorites. Ever since seeing Sophie‘s Lady Skater dress I knew I had to get that pattern! It was so awesome. I sewed my top entirely with my regular sewing machine and ballpoint needle and walking foot. I was under too much of a time crunch to try and run out and buy matching serger thread. The pattern is great and although I modified it to have a peplum-ish lower half, I really enjoyed making it. Amanda gives great instructions and tips on her blog as well. 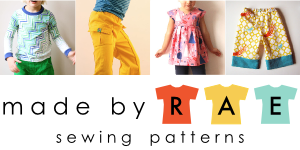 Including lots of info about sewing knits and different ways to modify the pattern. Trust me, she knows her way around knits and how to design a pattern for women, so I highly recommend it. I’ll definitely be trying the dress version, I love the way the pattern flatters so many body types. Oh, and I’ll be working on my Signature Style outfit over the next few weeks, couldn’t resist not being able to finish up! Meanwhile, be sure to vote for your fave over at Project Sewn this week! And last but not least I wanted to thank my little photographer. Natalie was not only a trooper for Project Sewn, but she takes any picture that I’m in that you see here in this space. She’s got a great eye, and I hope that she continues to be interested in photography. Of course we do go through typical 7 year old type craziness, too! Lots of outtakes of me pointing and talking and being totally awkward, yeah. Maybe I’ll post a few on flickr. I love that your 7 year old takes your photos too! Mine even directs me (which I find hilarious). BTW: you did a really wonderful job with Project Sewn. I was sad to see you leave! Your daughter takes great pictures! Oh, I can’t wait until my daughter is a little older and can be my regular photographer, that is so fun! And I love your top, the color looks great on you. Great photos and so fun to have a family project! What a beautiful top! It is lovely on you. it looks so comfy. i have never sewn knits on the machine, just by hand. might have to check out her blog for some tips. thanks. My 6 and 8 yr olds take pictures for me too. Definitely more outtakes that way, but at least you get daylight on your side! I also enjoyed your Project Sewn style. Your clothes seemed much more wearable on a daily basis than some of the others’ outfits. Thanks for the inspiration! Such a cute top! Are those the jeans you made? thanks Elsa! they’re not, but really similar ones. (they’re american eagle from a few years ago). Totally love that top and you nailed the fit! That neckline looks easy but it’s not. It’s beautiful and the color is fabulous! OMG, your daughter takes these? Wow, that’s impressive and… encouraging. I love when I realize that kids can be more capable than I’d guess. A very nice color an how perfect are your daughters pictures! What a great top! And the color is amazing on you. I think I’ll be looking into this pattern! What a perfect top! Great job with the pictures Natalie! Your work is amazing! This is a wonderful color on you. I can’t believe that your 7yr old take your photos. Tell her she is really good!! You did a beautiful job on this top! Love this top on you, and I’m so pleasantly surprised and happy to hear that Natalie is your photographer! She’s so good!!! Honestly I’m always telling my husband to hunker down a bit because he’s so tall he shoots “down” on me, not so flattering. I bet a 7 year old is almost the perfect height, haha! Gorgeous top and the colour suits you so perfectly! Great, This is really amazing page, here, I really enjoyed reading your thoughts, I will definitely share this article to my friends out there. Love this top and so proud of my niece for taking such great photos!